Would you happen to know the radii used for the fretboard and neck in the Time advance 3's? Also the width at nut and 22nd fret? The Advance 3's have a 9" radius, as all 25 1/2" scale Time Guitars. The 24 1/2" scale guitars have a 12" radius. This is the fretbroad radius. The Neck radius [back of the neck, I'm guessing] is a lot more complicated and beyond this post. When I have time I'll measure my AT-3 and post. All Time Guitars have the same neck widths, 24 1/2' or 25 1/2" scale length. The shape and dimensions of the Time guitar necks were not changed since I can remember. As I said, when I have more time I'll measure the neck width and post. Every Time guitar neck has these same dimensions. On the 25 1/2" scale guitar the measure is taken at the 22nd fret and on the 24 1/2" scale the same measurement is found at the 24th fret. 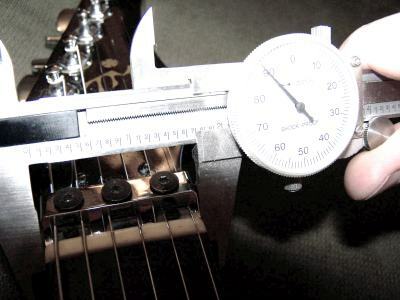 The length of the fretboard from the nut to the 23nd fret on a 25 1/2" scale is within a 1/16" of the length of a 24 1/2" scale measured from the nut to the 25th fret. The 23rd and 25th fret here are actually the end of the fingerboard. Confused? It's magic I tell you!